I'm trying to locate the exact location for the 'REDAN' which I believe is a trench in either the Hamel or Thiepval Wood area of the Somme. The 9th RIR were billeted at Mailly-Maillet early 1916 until July, and spent time in this trench? 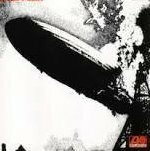 system, other trenches named are MOUNTJOY & TENDERLOIN. I have looked at some maps and am aware of REDAN RIDGE and MARY REDAN but not sure if this is what is being referred to by the use of term 'THE REDAN' in their diaries? Hopefully some of you sages will be able to help! 07/02 Ulster Div took over from River Ancre south of Hamel to the Serre Rd north of Auchonvillers with 107 Brigade in the north sector. 19/02 The WD puts The Redan in the centre subsector of the left 107 Brigade. 01/03 "Enemy exploded mine in the Redan 3 men of the TC being lost". 18/03 "Enemy shelled left Brigade (107) esp The Redan and Auchonvillers" (The 107 IB WD for this date records, "At 2 am the Germans heavily bombarded Redan, Tenderloin, Roman Road, Sucrerie, Auchonvillers also outskirts of Mailly"). There are some daily intelligence summaries that record a MG emplacement was observed at Q 10 d 8 4 to command MARY REDAN and our patrols went out from WILLIAM REDAN. 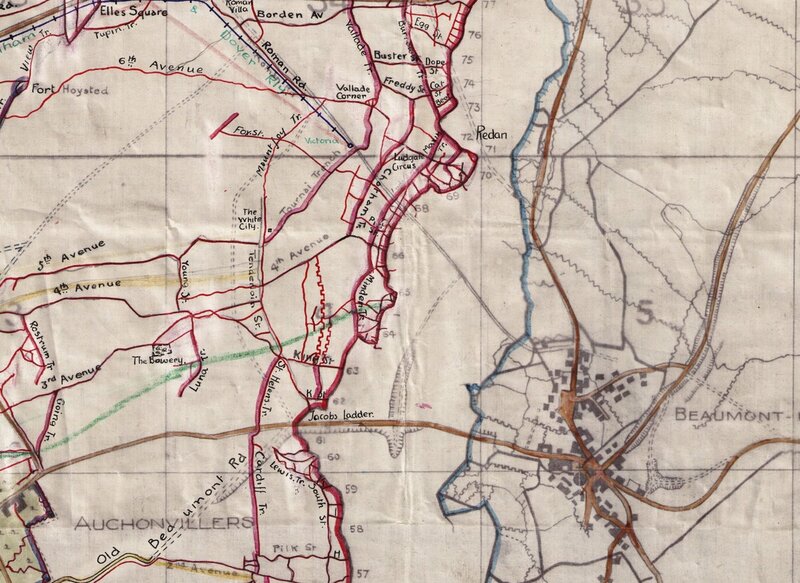 The maps in the WD do not go far enough north to cover east of Auchonvillers and the maps on the NLS system for the area (dated April 1916) only show Redan Ridge. There may be some further info in the 36 Div RE WDs I will have a look later. EDIT: The CRE 36 Div took over from the CRE 4 Div on 03/02/1916. The WD of the CRE 4 Div from 23/10/1915 explains what was going on at the Redan, without saying exactly where it was. 252 Tunnelling Co RE were employed there in November and December and fired camouflets on 30/10, 31/12/1915 and 16 and 17/01/1916. Edward, Mike and Brian, can I say I'm extremely grateful to all for the interest and support offered here! I'm of the mind given the billeting locations the area being referred to is somewhere N. of Hamel and W. of Mailley-Maillet i.e. Possibly Mary Redan or William Redan or somewhere else in this sector. I suppose I'd hoped that there may have been some definitive way of identifying it as I haven't been successful in locating a 'named' trench map for this sector as with some others, and may have just not been looking in the right places! Thanks for all the advice including the NLS (Mike) which just doesn't cover the area fully as Brian 547 has stated. Hopefully with the knowledge and understanding on here if no definitive answer is available that an educated guess may be offered? Thank you all once more for your time and knowledge. Have attached a rough position of the Redoubt in a Kmz file. There is an OH Map that shows the Redoubt but I cannot copy it from the Naval & Military Press disc. Mike thanks again for your informative response. I'm inclined to agree with you that the REDAN referred to is the REDAN REDOUBT. Having read some further extracts from the 9th RIR diaries, they indicate sending 200 men as a working party to the REDAN, which I feel is a substantial work force for just a trench, also the 'OC REDAN', but probably more conclusive is they refer to activity (ferry lights) from the QUADRILATRAL, which was referred to the Germans as the 'Heidenkopf' (also mentioned in newspaper article link sent). This German redoubt I understand was situated on the NE corner of Serre Rd No. 2 cemetery and the trench lines are shown on NLS map 57D NE, just above your google earth map pin. So I think unless a conclusive map turns up this is probably the best informed answer available. Your time and effort are greatly appreciated! I think this shows “The Redan”. This is from an extraordinary map, it is hand drawn on linen by S Mildred, the CRE of 4 Division during the Battle of the Somme. It appears to be dated 8th October 1915. Full version here. If you ever try it by tracing or other means, hand drawing maps with modern pens is difficult. If you then try it using old spring-bow pens and Indian ink, it is very much harder so hats off to this cartographer. 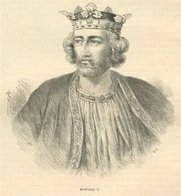 That is really impressive Howard, absolutely superb as a historical document and also as a piece of cartography. Having made the odd map in my younger days I'll doff my cap metaphorically to Mr Mildred. Howard you have definitively resolved the location of 'THE REDAN' for me. The map is superb!!! It confirms also the other trenches mentioned in their dairy are MOUNTJOY and TENDERLOIN which are quiet clearly written on this map, so once again can I say a great big thank you to all the contributors here, who give of their time and knowledge to assist us the less well informed! Great stuff. Hopefully that's not too far from google earth guess. What an excellent map Howard. Where did you get it? Do you not think that the person who copied the map left out the word Ridge as it appears in the margin of map 57DSE1 and on the map north 57DNE3&4 the word Ridge is in the map and the word Redan in the margin. In effect it is Redan Ridge. More to follow when I've gone through my notes. I spent 4 years scanning the IWM collection, part of that work is published on the WFA Mapping the Front DVD collection. This map is on the Somme discs. It would be interesting to know why this bloke spent so long making the map, it must have taken many hours. Even the base map is hand drawn, at least the colouring is all hand done. Some maps have hand drawn detail over a printed base but these are always on linen backed paper or plain paper. At the time there were several problems with maps, one was the shocking state of the French maps to use as a start to produce up-to-date maps of various scales, the RE had to re-survey the front in a hurry. As this map is late 1915 it may be part of that re-survey by why hand drawn? Another problem was the delay between gaining intelligence of German works and getting that shown on British maps- that is what led to some British maps having hand drawn detail but this map is a puzzle. It is drawn on that curious shiny “sealed” linen, it is not the kind of stuff normally used in the contemporary lithographic processes and it has a distinctive look not found elsewhere. I have come across other hand drawn maps with their own look but those were usually produced post war, it is possible that this map was made post war but dated 1915 as part of a report. That may never be known as some time ago, some idiot in the IWM decided to split reports from their maps and store them separately, naturally a lot of context was lost. Yes, that is what I thought after my research this morning. I am unable to check because my downloaded WD of 252 TC has not hit my inbox (yet). 01/09 "Mines successfully exploded 3 50 am Germans retaliated and a crater formed within bombing distance of our papapet"
Map on page 727/808 shows William Redan N E of Hamel and Mary Redan S of Y Ravine. Both are shown as salients. These were smaller separate Redans. P 87/491 is a report from the OC 9 FC to the CRE that he received a visit from the Brigade Major 12 IB as to what to do with the crater (formed on 01/09). His sketch plan on p 90 shows the crater in front of Redan Trench. The WD of 252 TC RE is well worth reading from November 1915 to April 1916. Hello Jez, not sure if Mary Redan occupies the area just south East of the area you highlighted, (South east as you are looking at the map). I may be wrong but always thought is was nearer the fork in the road. And that William Redan was more over towards the Ancre Cemetery. Interesting area to walk though, back there in May (Brexit permitting!!) Ian. I think you will find that Mary Redan is located at approximately 17. a. 6. 4 or a.5 .5 which puts it some distance north of the fork in the road, as per Jez's post, with, indeed, William Redan being in the vicinity of the Ancre Cemetery. I've always taken the "Redan" to refer to the area of the Redan Ridge. 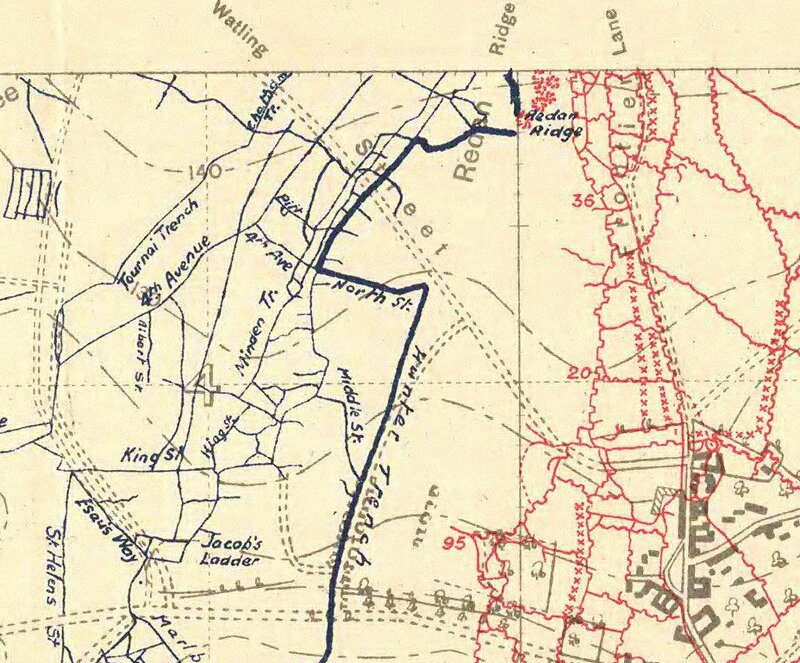 There is a 1:5,000 trench map headed "Redan" which refers to that area. Please see post 20. There is a map showing the locations of William Redan and Mary Redan in the WD of 4 Div HQ General Staff - Piece 1443/1-4 - pp 727 and 728/808. but that may be a co-incidence as the maps were separated from the relevant reports.